I am sure many of you are facing the same trouble of having a fridge full of turkey dinner. We don't just have turkey left overs but we had lots of every thing left over from our Christmas feast. So this weeks meal planning as been centered all around how to get rid of these wonderful foods. We love making Chicken Enchiladas so with turkey leftovers I knew these would taste just as good using turkey. Even with being filled with all this turkey my creative meal idea juices are still flowing. Seeings how we can't fit anything in our fridge because its stuff with containers of leftovers I dug out the cranberry jelly, stuffing and turkey to try a new Enchilada recipe. Usually we stuff the tortilla with turkey, cheese, black beans, corn and sour cream but this time I decided to spread the tortilla with cranberry jelly, stuffing and turkey. WOW!!! They were a hit and a recipe that I will make after every turkey dinner!!! 2. In a large frying pan I made basic white sauce. 3. Add cream of mushroom soup and fill the can up with milk. Stir and let simmer. Add any spices you like until it taste the way you like. Add fried onions and garlic. You don't have to make the basic white sauce but hubby loves to have sauce to add to his other foods so I try to make sure there is lots of it. 4. Pour a little bit of the sauce into a 9*13 baking dish. 5. On a tortilla spread cranberry jelly and top with stuffing and turkey. Roll up and place steam side down. 6. When pan is full pour a little bit of the sauce over the enchiladas. Make sure that the sauce gets in between each enchilada, if it doesn't they will stick together. Pour the rest of the sauce over the dish and top with cheese. ~ To get rid of the rest of the turkey dinner sever the enchiladas with mashed potatoes, squash, and any other leftovers you have from our turkey feast. Hey readers. I know that you are probably expecting my meal plan for the week but let me tell you its not exciting. You see I have a fridge filled with leftovers that needs to get eaten so for the whole week we will be consuming turkey, turkey and more turkey! I will be back next week with some creative meals and to tell you how I cooked all the turkey! hehe..
To check out our Christmas adventures head on over here! I can't wait to post all about my homemade gifts , goodies and treats that we enjoyed over Christmas! I just can not believe that Christmas is here again for another year. Last year at this time I was very preggo and over due just praying for the babe to come out!! Of course he wanted to give Christmas an extra special meaning and decided to make his appearance Christmas morning when everyone else was opening presents. So now Christmas time every year will be a little bit different!! This past weekend we gathered with hubby's family for our annual gift exchange. This is always a great time together sitting around opening the presents we bought for one another, sipping cider and stuffing our guts with so much food. Its the one time of year that we all splurge on expensive and very delicious cheeses!! I don't know if I am ready to cook after a weekend like that but the family must be feed. Here's whats cookin in the kitchen Christmas week!!! Monday: Sweater Party at the Peterson's. Its a pot luck so our lucky dish will be Mexican Mesegna and I might through together this delicious pot luck chip dip. Wednesday: Mom and Dad will be coming up and we have been invited out for Jigs dinner (its a Newfoundland thing). I think that after the church service we will come home and enjoy my moms famous taco dip, cheese, crackers and a BBQ meat pie! Thursday: Turkey Dinner, although I do like Niki's idea of have a big breakfast and then Turkey boxing day but I will have to convince hubby of that one. Maybe next year. and don't forget we drown everything in GRAVY!! What Christmas supper for us with out Pumpkin Pie!!! Cold pumpkin pie. We aren't ones for hot pumpkin pie, the one year we did try to serve it hot half a piece ended up in grams tea. Friday: After breakfast we are heading away for the weekend. To enjoy another Turkey Supper on Saturday. 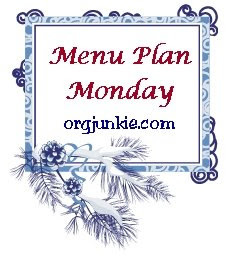 For more great meal ideas check out Organizing Junkie. I love the Christmas season because its a time of year when you are always going out to gatherings or you are hosting people in your own house. Since I love hosting I never give up an opportunity to have a party. I always like to have something special to give my guest or to take to others houses as a hostess gift. This year my gift is chocolate covered spoons that can be added to hot chocolate or coffee. This year at our Christmas sweater party this will be my center piece when hot chocolate is served. Since I will be having people into my house I used our extra silver wear and dipped the spoons into melted semi sweet chocolate. Some of the spoons got crushed candy cane added to them well others were left plain. I also dipped some plastic spoons and wrapped them in festive holiday wrap to give out as gifts when we go to other peoples houses. After years and many failed attempts I finally got lentils to cook for me in a very delicious recipe that I found on $5 Dinners. I stumbled upon the recipe while searching some of my favorite site trying to find something to make my friend Renee because she just had baby number 2. 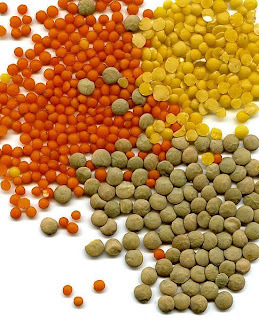 Knowing how much they love dried beans and lentils I decided to work up my courage and try this recipe Honey baked lentils. I used green lentils in the recipe and didn't use the bacon (sorry Stam's). Because it makes such a large dish hubby and I tested them out before we gave it away and we loved them. The only change I would make for next time is cook the onion first before placing it in the dish and I had to cook it in the oven for longer then the recipe called for. Sorry the picture doesn't look pleaseing but it did taste good. We served it over garlic mashed potatoes. Woo....now that I got that recipe to work I have a bunch more lentil recipes to try!! I don't usually do any special plugs for kitchen gadgets because most of the time I pick my stuff up at the local dollarama or a second hand store. There are a couple of nice kitchen tools that I do enjoy using as they make the work a lot easier. These guys have seen their fare share of cookies and cup cakes over the years. I even used them once to decorate the top of my Shepard pie. They are from a purchase I made at my one and only Pampered Chef party I attended. I had never really been to a party like that before and didn't realize (until it was order time) that most people buy stuff at these party's. I had looked through the book but come on everything was so expensive so as quickly as I could I looked for the cheapest thing available and it just so happened it was these 3 little guys (thanks monthly specials). They have made decorating the Christmas cookies a whole lot easier and you can be more creative when decorating. They only thing I don't like about them is its hard to get the frosting into the tiny opening at the top and its hard to get it out when washing. They do come with a little scrub brush that you can use and it works pretty well. I am sure you can pick these put at yard sales and I saw them on Ebay for pretty cheap as well. Today I want to sent you over to a blog that I enjoy reading myself. It's called Happy to be at Home. 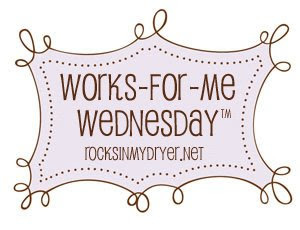 Three stay at home moms contribute to the site sharing lots of information; and every week they have specially guest blogger's. 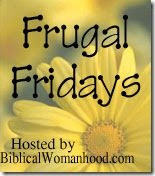 For the month of December they are doing a series called Frugal and Fabulous Christmas. 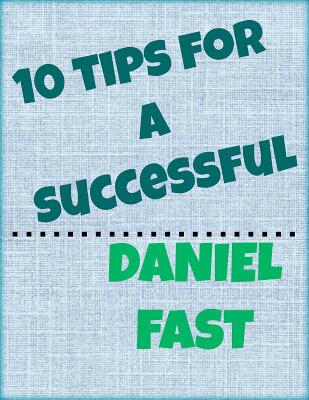 Some of you may remember my post last year on decorations but in case you don't I wrote a guest post for this blog and it was published this past Friday. So hope on over to Happy To Be At Home and check out my Homemade Christmas!! Wow...this week went by so fast with all the practicing we did for the Living Nativity. It was a week of road meals and beans. I didn't realize when I baked the beans on Monday night that it was a 2lb bag and not a 1 lb. Needless to say we have been eating beans everyday this week. One of our new favorite combination is a Mexican Rice dish that I just made up. There isn't really a recipe so be bold and create it to your family's taste. I cooked some rice and well it was coming to a boil I added minced onions, chili powder, and cumin. When the rice was finished cooking I added cheese whiz, salsa, left over cheese sauce from the scallop potatoes and the baked beans. Oh the spicy flavor of the salsa goes wonderful with the sweet taste of the baked beans. We enjoyed that dish especially when we used nacho chips for forks. ~Fry hamburger at medium heat, drain grease; add the mushroom soup and the onion soup mix and stir. Add a little milk if the sauce is too thick. Simmer on low heat until hot. ~Drain the cooked noodles, and add the crackers. Mix. ~Serve the hamburger sauce over the noodles! Yum! Friday: Leftovers and we are on our way home for our family Christmas exchange!!! Good morning readers. 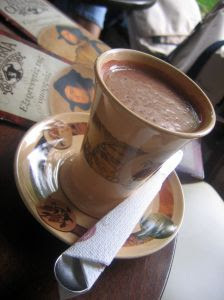 I thought with the cold weather and snow on the ground (or should I say freezing rain) I thought I would share this homemade hot chocolate recipe. I found it last year and after a fun afternoon of sliding this hit the spot. Combine the first 3 ingredients into a large pot. Cook on medium heat and gradually add water. cook until heated through; stir in vanilla. Serve in nice mug and top with whipping cream and shaved chocolate. Or to make it more of a festive Christmas drink stick a mini candy cane over the side of the mug for a mint chocolate taste. We will be enjoying this treat this weekend while we are decorating our tree and finishing up our Christmas baking!! The little apartment size deep freeze that we have in the basement has been on of our biggest blessings. This little guy is packed to the gills with meats, breads, squash, berries, and at the moment Christmas baking. This summer after doing a shopping trip in the states I posted about freezing different foods asking you readers what kind of things you put in the freezer. This way I would have a massive list of foods that I could jam into my deep freeze. Now for your help again. I just recently stumbled across a very large bag of garlic on the reduced rack at the grocery store. 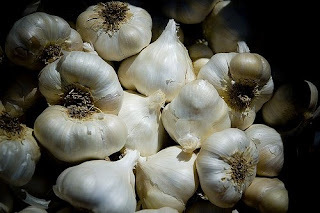 The garlic is in the bulb form and I was wondering if any of you have frozen this stuff before. I did do some research and some say you can just peel and freeze others say you should mince , puree and pack in oil. I am just wondering if you guys have any suggestions?? Egg rolls are a favorite of ours that we only get as a treat when we order the combo for four from the Rice Bowl. So you can image how excited I was to try out this recipe when I found it one day while reading some ones meal plan. They were very easy to make and actually didn't cost a lot money. It was cheaper to make 18 egg rolls then it was to buy 6 in a package. So here is my step by step on how to make you own egg rolls. 1. Stir fry meat and ginger until meat is lightly browned. Add shredded cabbage, carrot and green onion. Cook until veggies are wilted. Stir in soy sauce or oyster sauce. Allow to cool. Once the mixture is cooled you can begin to wrap the egg rolls. First start off by placing the wrapper on a working surface. They place the wrapper in a diamond shape. Place your filling in the center or the wrapper. Fold up the bottom edge and roll under once. They bring in the two sides. Next I wet my finger in a little bowl of water and wet the edge of the wrapper. Continue wrapping up the egg roll. Then place the wrapped egg rolls on a cookie sheet covered in wax paper. When ready to cook add two or three to a deep fryer that is set on 375. Let them cook about 3-4 minutes. When done drain on a paper towel. Serve them warm with your favorite dipping sauce. They also freeze very well. Although the once that I did freeze are gone already as hubby just LOVED these things. Now I know why I should have doubled the recipe. Maybe I will have to make a batch (secretly) and freeze them before I give my friends back their deep fryer. Another week gone. I can't believe how fast the weeks are flying by. Last week I nailed the egg roll recipe. Thanks to the Dail's for letting me borrow the deep fryer, I will need to give it back ASAP as it is dangerous for us to have it in our house. The recipe made 18 egg rolls and we just finished the last one tonight, sorry to the Dail's for not saving you any...I couldn't stop them (Micah and Weiwei) from eating them. I will be posting my step by step on how to make these. 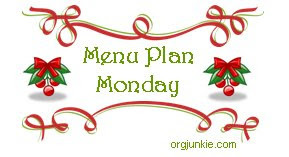 This weeks menu is very simple as we are trying to cut back on spending too much this month and we are both involved with the Christmas production at our church. The Nativity Experience will be this weekend so our week is filled with dress rehearsals. This is always a fun time for us as we enjoy being a part of this production each year. There is lots of live stock, cookies, music and of course the message that God gave us the greatest gift of all His Son JESUS!!! Hey readers. 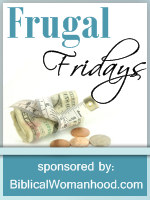 You are in for a treat today as I share some of my simple yet frugal Christmas decoration ideas. If you didn't get to read my decoration post from last Christmas jump on over here to check out my cinnamon ornaments, dried fruit and reused light bulb decorations. This year I added a few more craft projects to my list of decorations. This large candy mint wreath turned out very well and is now placed on my bathroom door. It was easy to do and was made for $2 (cost of mints). I actually cut a wreath shape out from a diaper box we had laying around the house. Then using your hot glue gun you glue 2 rows of green mints and then glue the red mints to over lap the green ones. Add some curly ribbon and a ribbon to the top to hang it from. With the left over mints I did two mini wreaths, one red and one green, to hold up our Christmas card close line. OH to get the cardboard green I just used a crayon and colored it. The one thing I love about decorating is that you can use what you have around your house to make it more festive. We have 2 shelf's that sit in the bathroom corner. So to decorate them I filled up some vases that I have with shinny beads that I picked up at the thrift store ($2 for a large bag of them) and placed some plastic ornaments on the top of them. I did the same with this one, which is also in the bathroom. Excuse this next photo the mantle isn't finished being decorated yet as I am still on the search for some greenery for it. But I just wanted to show these glasses that I filled with beads and placed some gold bells on the top. Also you can see my hanging dried fruit and cinnamon ornaments. This was my last craft project for this Christmas. Its our homemade advent wreath. I really wanted to do this one but instead it turned out like this. I used a wreath that my friend Niki gave me and placed some glass candle holders around it. Then in the center I put a white glass candle inside a larger candle holder that has big beads in it. Each week we light a new candle. They are suppose to be purple and pink but I thought that as long as I had 3 candle holders the same and one different it would be ok. 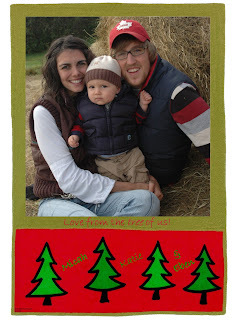 This year we decided to use a family picture that we had taken this fall as our Christmas cards. I have a close relative and friend who has a great photo program on her computer with lots of back grounds who put this together for us. Its great because these were printed off as a normal 4 *6 during a print sale so I got each copy for 10 cents !! Pretty good price for Christmas cards. Since it is now December we are giving them out to our friends, family and now to all my wonderful blogger friends!!!! But there are always the ones that need to be mailed so what do you do about them. This year I decided instead of making another card to go along with this card that I would decorate the envelops instead. I think that Christmas cards with pictures on them are the best way to up date peoples photos of you and it saves on paper; as most of the people getting our cards live close by and didn't need an envelope. We defiantly saved on postage this year to as we did a drop off with both of our parents to hand them out. So if you are from the home towns and have not yet received yours yet don't worry its coming!!! I also wanted to share this picture with all you readers of my son (in the middle) and his two friends. 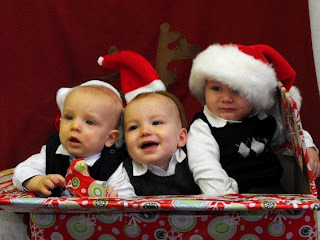 This picture was taken and used on the Christmas card for the Pregnancy Resource Center here where I volunteer. It was simple to do; well not getting them all to look at the camera and smile at the same time. We wrapped up a large box that I got from our local Home Hardware store with bright wrapping paper. Dressed the boys up in the same outfit and stuffed them in the box. For the back drop we used bed sheets to cover up the background and stuck some Christmas hats on their heads, let them play and tried to snap at least one descent picture of them. Oh what did we do before digital? If you would like to have a picture put in a Christmas card format like we did check out my friends stuff Photo's by mum if you are from this area she is willing to do them for $10 a template.